Hey everyone, I’ve received my The Flawless & Fierce August Fab Bag yesterday. This month’s bag itself is a stunner. 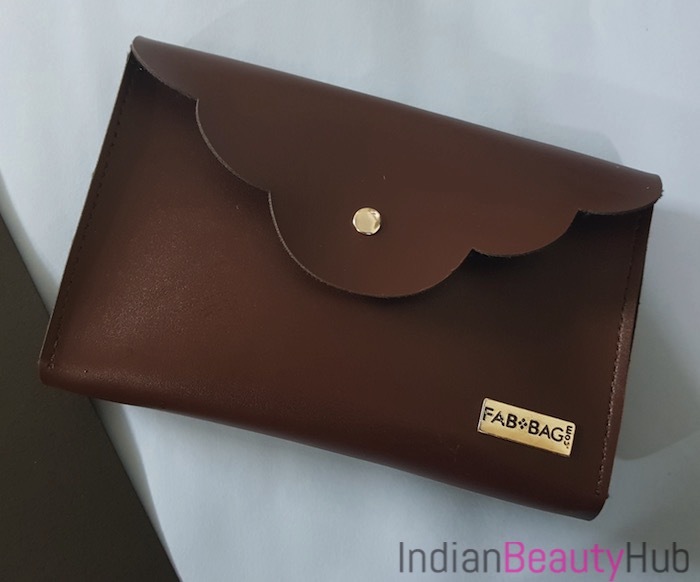 It is a brown colored clutch style pouch that looks very chic and classy. 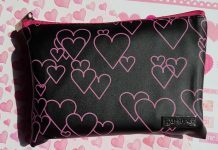 It is one of the best fab bag I’ve received so far. 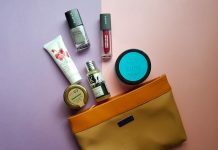 The products I received in my Fab Bag are – lipstick, scrub, dry shampoo and a sheet mask. 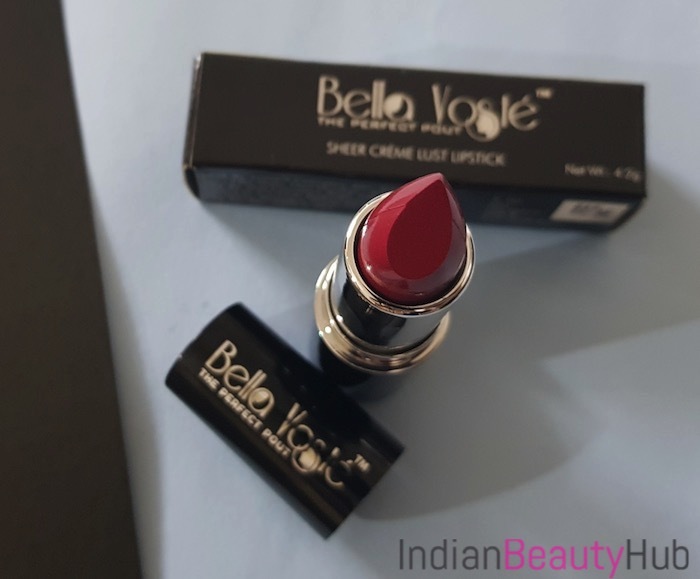 Bella Voste Premium Satin Touch Lipstick: It is a self chosen product and I chose the shade 18 Celebrity. It is a beautiful rosy pink color that flatters my fair complexion really well. It is very pigmented and gives intense color payoff with just 2 swipes. It feels light on the lips and stays put for good time. I absolutely loved the shade and will love to flaunt it on casual outings. Price – Rs.499 for 4.2g. 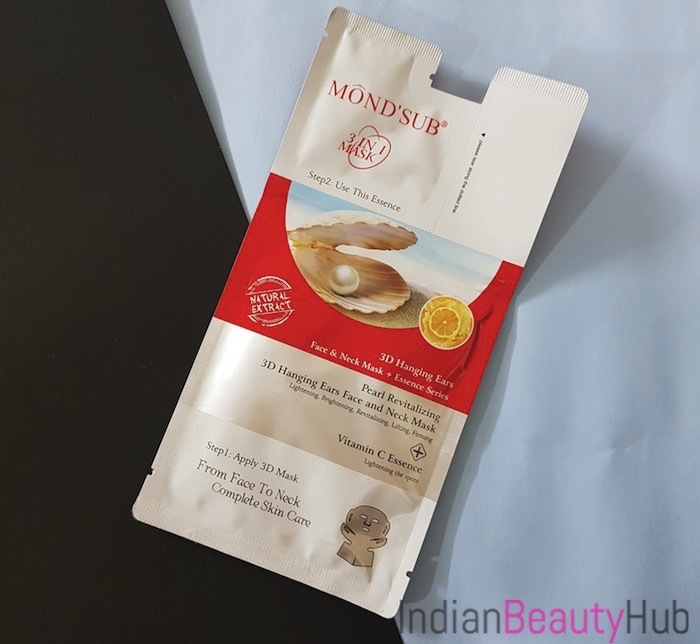 MOND’SUB Peral Revitalizing & Brightening 3D Hanging Ears Neck & Facial Mask: MOND’SUB sheet masks are all over Instagram these days. I really liked sheet masks as they are less messy and you can use then anytime anywhere. The mask I’ve received is a complete skin care mask that will not only cover you face but ears and neck too. I’m excited to try it and will share my experience with it very soon. Price – Rs.200. Opulence Sugar Scrub: Next I got the full size pack of sugar face & body scrub. It is enriched with amazing natural ingredients like brown sugar, almond oil, olive oil, vit E, papaya, orange, argan oil, honey, etc. 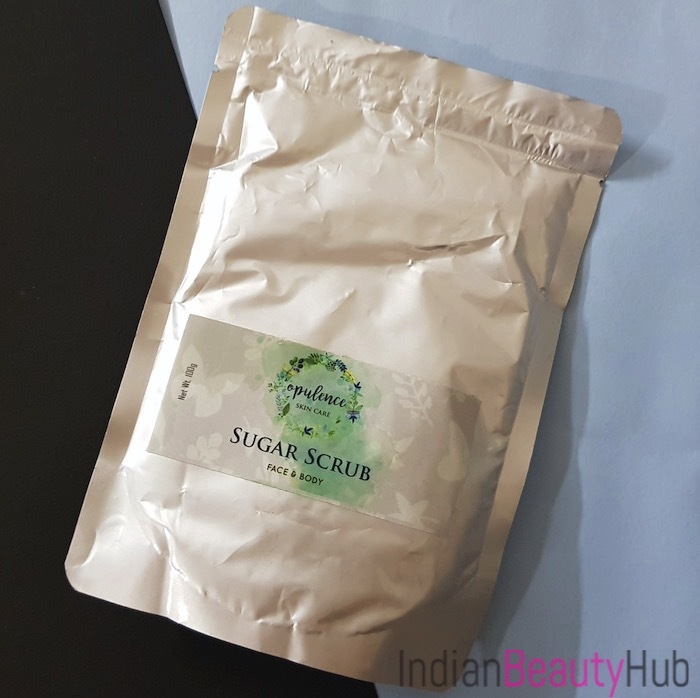 The scrub looks interesting and I’ll definitely give it a try. Price – Rs.500 for 100g. 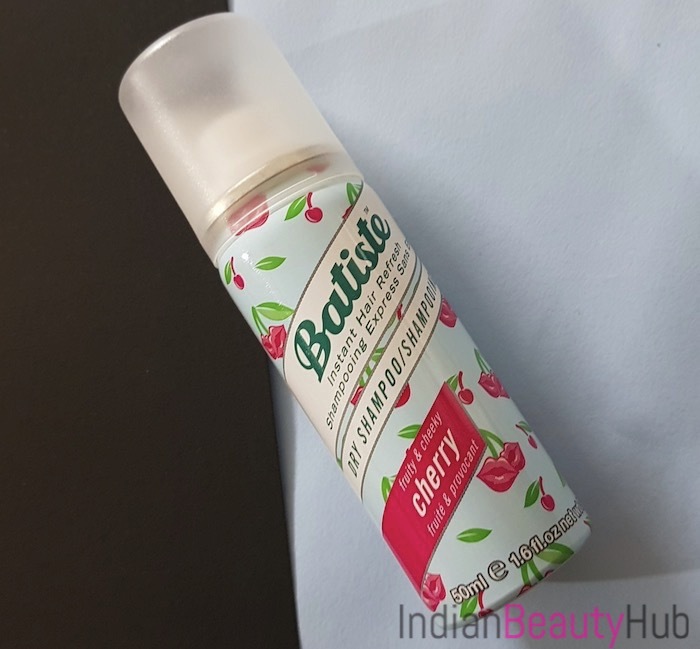 Batiste Dry Shampoo: Last but not the least they’ve sent the travel size bottle of fruity & cheeky Cherry dry shampoo. It is a perfect size to travel with. Though I don’t use dry shampoos but my hubby can definitely give it a shot. 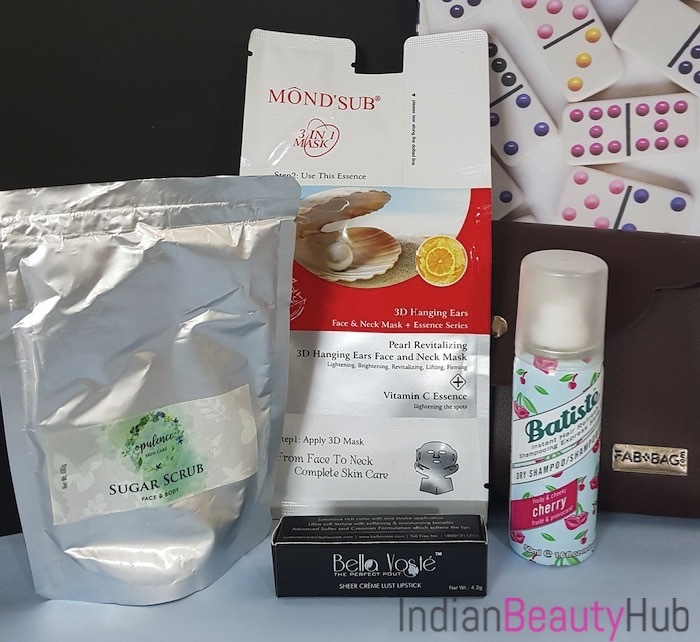 Price – Rs.299 for 50ml. Overall, August Fab Bag is an absolute hit in my opinion. 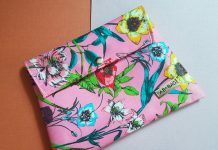 It contains variety of good quality products and not to forget the stunning clutch that came along with the products. 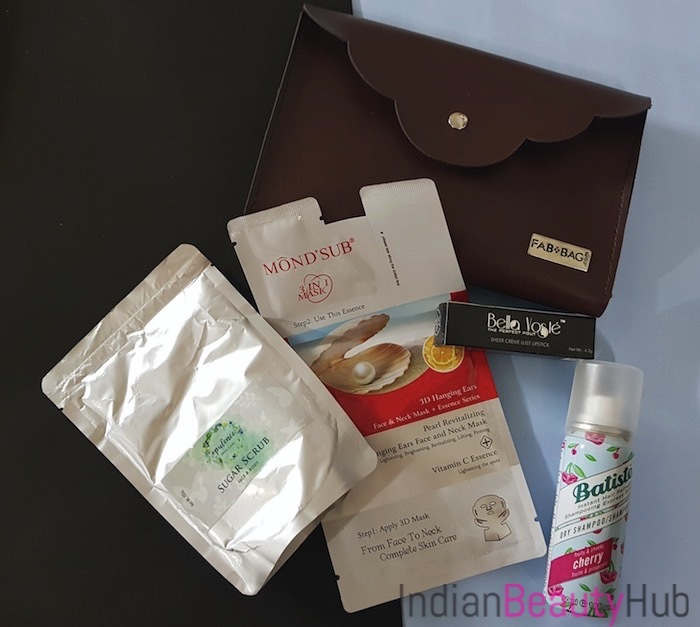 I really liked all the products and will definitely recommend buying the August 2017 Fab Bag. Hey , after looking at your review. I have ordered the Auguest fab bag, but i was now where given a choice to choose the color of the lipstick. Am I missing something. Please help.